Today Big Data crosses all productive activities globally. Effectively, companies are generating data at a vertiginous pace, which is why their management has become a fundamental challenge. With the right strategy, Big Data can be a powerful tool for the creation of market solutions, understanding the dynamics of the environment and develop business strategies that make the most of innovation and the efficient use of technology. 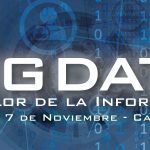 That is why Big Data was the theme of the 11th International Seminar of Fundación Copec-UC. In the activity, headed by the president of the Copec-UC Foundation, Roberto Angelini, Patricio Donoso, Proprinter of Institutional Management PUC and Gonzalo Rivas, President of the National Council for Innovation for Development (CNID), the phenomenon of digital technologies was analyzed in areas such as astrophysics, biomedicine and marketing. For its part, facing the current challenge of managing increasing volumes of data, Rob Thomas, one of the main speakers, co-author of the book “The Big Data Revolution” and vice president of Product Development at IBM Software Group highlighted that “the Big Data will change the way we live and do business, as well as how we analyze information to obtain comparative advantages. In this new era, in addition, we are going to Data Science and for this we will need to understand the skills that this requires, which in turn will involve redefining the roles within companies and instructing workers. We are facing important changes in the volume, speed and value of information… we are entering a stage where we use Big Data to create new business models “. During the activity, the best initiatives of the second contest for students of higher education “Apply your Idea” were also awarded, in which the projects were distinguished: Beetecnology (U.Mayor); Ayún (U. Valparaíso); HH Motors (UTFSM). Copec-UC Foundation fundamental objective is to disseminate and promote scientific and technological research related to the country’s natural resources. Centro Innovación UC Anacleto Angelini, 10th floor.